Relations between Russia and Israel have been those of an estranged couple punctuated by occasional breakouts of tense understanding. As with other such couples, a public row does not necessarily reflect the more placid, if stern discussion that might happen behind closed doors. On the public side of things, Russia’s decision to deploy the S-300 anti-aircraft missile system to Syria has made Israeli officials apoplectic. That said, Israel’s security establishment were privy to prospects of a possible Russian deployment of the modern, more discriminating air-defence system. The former head of the Israeli Defence Force’s Strategic Division, Brigadier General Assaf Orion at the Institution for National Security Studies, was reflective. 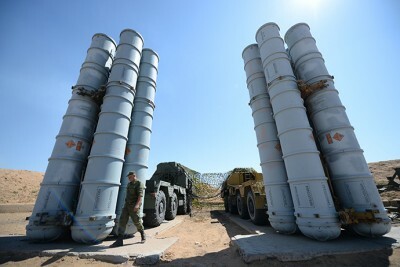 In April, Amos Yadlin, the country’s retired Military Intelligence chief stuck his head out to issue a warning: should Russia supply Syria with S-300 anti-aircraft missiles, Israel’s air force would retaliate. Israel Defence Minister Avigdor Lieberman also upped the ante, suggesting that Israel would destroy any S-300 targeting Israeli aircraft. Would Russia call’s Israel’s bluff? Russian Defence Minister Sergei Shoigu has only praise for the batteries, which are “capable of intercepting aerial attacks at the distance of over 250 kilometres, and simultaneously countering several targets”. Deploying it was a necessary “retaliatory” measure. Gideon Levy, writing in Haaretz, was impressed by Moscow’s move. Israel’s regional bullying would finally, at least in some fashion, be contained. Dr. Binoy Kampmark was a Commonwealth Scholar at Selwyn College, Cambridge. He lectures at RMIT University, Melbourne. He is a frequent contributor to Global Research. Email: [email protected].